1. History is not the source of understanding Islam. 2. In the hereafter we are not going to be asked about our views on personalities who lived in the past. Our views about them are not criteria for going to heaven or hell. 3. Any views we have today about personalities in the past inevitably are based on those historical records that we rely on. Historical records are often inconsistent and each of us choose the version that we believe is more reliable. Having said that, I have done my best to make sure what I have written here is based on commonly accepted facts of history. 4. This is simply a writing about how I see Hussain. My intention is not to defend or criticise any religious sect. ​5. Some readers may find the latter parts of this article to be a bit emotional, and therefore quite different from the rather rational style of writing that I try to adopt in Exploring Islam. I think they will be right in thinking so. However I also think that sometimes, and for particular topics, blending the thought with sincere emotion is itself rational. The story of Karbala is in deed one of those particular topics. With the above points in mind, I proceed to express my views on the subject. Based on verse 42:38 and based on the Sirah of the prophet (pbuh) the affairs of Muslims needs to be managed by consultation. This includes appointment of the head of the state as well. The appointment of the first four khulafa (who were among the closest companions of the prophet – pbuh) was in principle based on consultation (and I do not claim that the consultation process took place in its best shape in these occasions). While each of the first four khulafa had sons or close relatives to appoint as their successor, none of them did that. In fact according to some historical reports Umar ibn Al-Khattab made sure that people did not think that he had any intentions to appoint his son as his successor. Ali ibn Abitalib, according to another report, left it for people to decide, when they asked him about his elder son Hassan who at the time was perceived as a qualified candidate. I do not want to go to the historical complexities on how Mu’awiyah became the head of the state. The fact however is that the sheer information that Yazid became his successor indicates that Mu’awiyah did not exactly follow the above procedure. He was in deed the starting point for turning the Shora (consultation) system to a Mulukiyah (kingdom) system where people or their representatives had no say in the appointment of the head of the state. Normally, one of the consequences of such imperious kingdom system is that gradually (and sometimes immediately) the main agenda of the ruling body will be to keep the authority within the family line, which then normally results in extreme oppression and injustice. This is while establishing justice should be among the most prioritized agendas of a ruling system in accordance to the Qur'an (4:58,38:26). As Muslims, we are still suffering from the long lasting damage that centuries of dictating kingdom systems have brought to us. Without necessarily getting involved with too much complexities to verify or reject historical reports, the least that can be said is that Yazid was nowhere near the qualifications that a head of a Muslim state needed to have. A quick look at the atrocities that happened under his direct or indirect command is an evidence to this. This is while at his time there existed numerous other potentially qualified candidates, including some of the companions, and in particular Hussain ibn Ali, who were way above Yazid in terms of their reputation of knowledge of Islam, piety and justice. It is at this juncture that Hussain the grandson of the prophet (pbuh) started a movement. A number of great personalities did not submit to Yazid and did not pay allegiance to him, Hussain, at least in the light of his relationship with the prophet (pbuh), was the most important one. Hussain, a member of the Ahl Al-Bayt of the Prophet (pbuh) who was known as a very pious person at his time, was put in pressure by the ruling system to pay allegiance to Yazid. Since he did not consider Yazid to fit the office of Khilafah he could not submit to this. This was the main reason that he left Medina and then Mecca. It is also evident from the reports that he initially trusted the invitation of the people of Kufa and headed towards them to benefit from their support. - Stage One, from Medina to Mecca: It seems that the most influential reason that made Hussain leaving Medina for Mecca was simply to avoid being in a situation where he would be forced and threatened to pay allegiance to Yazid. It is reported that while leaving the city of Medina he read verse 28:21 of the Qur'an: فخرج منها خائفاً یترقب (so he went out of the city fearful and vigilant). One, and the main one, was that he felt his life was in danger due to not accepting Yazid (according to one report, he had concern that Mecca’s respect could have been violated if he stayed in the city and was targeted by Yazid’s army as the result. We know from the history that the Mecca and Ka’bah’s respect did not stop Yazid’s army to attack and ruin the city and Ka'ba when ibn Zubayr chose to stay there). 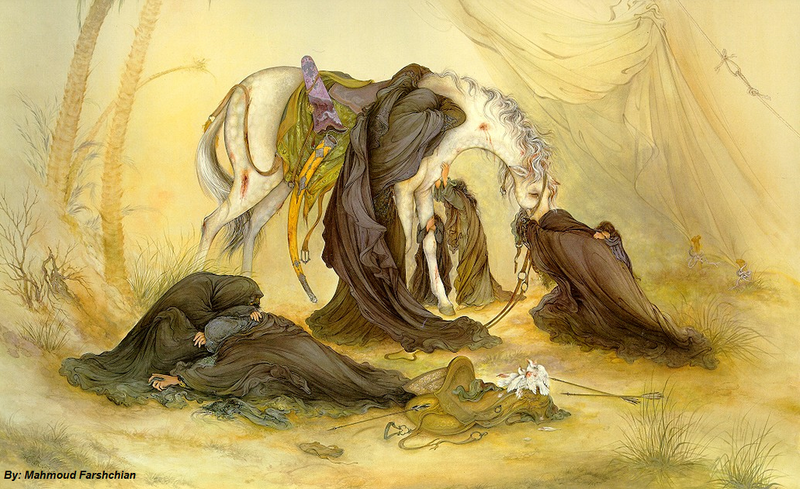 The second reason was that on the basis of the letters that Hussain received from the people of Kufa he thought he could migrate to Kufa and with the support of Kufies make a base there for himself to remain safe and to be able to freely reveal his views about what was going on in the Muslim state. His main wish, as revealed by reports, was to be able to fulfill his duties of Amr bi Ma'ruf wa Nahy an al-Munkar (advising to good and against evil). It is important to note that the overall more reliable reports about Hussain's move do not give us any indication that his primary motivation was to fight with Yazid and become the head of the state. However in the light of the nature of the letters he received from Kufies, it is easy to imagine that his presence in Kufa would also give him a chance to gradually prepare the way for making an alternative state (note, Yazid had just started as the ruler). I therefore disagree with the view that Hussain's motivation was to start a mutiny, unless by mutiny we mean not paying allegiance and remaining critical of the ruling system. This does not mean that I see any moral or religious issues if Hussan's motivation was in fact mutiny, in the meaning of military uprising. - Stage Three, the last days near and in Karbala: It was at this stage that Hussain was convinced that those who wrote letters to him, under the influence and by the threat of ibn Ziyad, the Yazid's appointed governor of Kufa, had in fact turned their back and that many of them were now against him. It was at this stage that as reported in the history Hussain dropped the idea of going to Kufa. Based on some reports he even suggested to be allowed to go to Yazid and discuss the matters with him directly. Ibn Ziyad however did not allow this and demanded that Hussain should submit himself to him. At this point as a matter of principle and honour, Hussain rejected ibn Ziyad's command. He considered it to be nothing but humiliation and oppression, possibly followed by an unjust execution. Hussain was in deed put in a no-way-back, no-way-forward situation. The army of ibn Ziyad, headed by Umar ibn Sa’d, had surrounded Hussain and had given him only one option, to submit himself to ibn Ziyad. If any one wonders why it was humiliating for Hussain to surrender to ibn Ziyad, then I suggest one needs to study who Hussain was, and who ibn Ziyad was. So a journey that started as an escape to safety, blended with religious/political move, ended as an epic, during which Hussain and his family and companions bravely sacrificed their lives to avoid humiliation and oppression. A group of around seventy people, accompanied by women and children, defended Hussain against the full army of Umar ibn Sa'd, sent by ibn Ziyad (according to reports, around 5000 men). Within less than 24 hours, and on the 10th of Muharram of 61 AH, Hussain and his men were martyred and beheaded by the army of Umar ibn Sa'd and their women and children were arrested as prisoners of war. Hussain had a very limited number of people accompanying him, while ibn Ziyad had sent a proper army to him. Hussain never intended to carry out a military action, he had his family, including women and children with him. The grandson of the prophet (pbuh) who according to sahih hadith was promised Jannah (heaven) by the prophet (pbuh) was brutally killed only fifty years after the demise of the prophet (pbuh). His body was beheaded and his family, including Zainab the granddaughter of the prophet (pbuh) were treated as prisoners of war. As for whether Yazid was responsible for the martyrdom of Hussain, I appreciate that Yazid was not directly involved in killing Hussain and based on some reports, never intended to do that. Based on the reports he did not approve Hussain's killing and expressed his sadness about that. Based on these reports, while defending his stance, he even tried to be kind and passionate towards the women and children who were left from Hussain's caravan. However the fact is that it was the system led by Yazid that resulted in such an awful tragedy. Although Yazid seemed to be disproving the killing of Hussain we do not read anywhere in the history that he made any attempts to bring those responsible, to the justice. In fact those who were responsible remained in their offices and some were rewarded. We also do not read anything in the history that would suggest that he changed his ways as a lesson learned from the martyrdom of Hussain. Atrocities including killing of innocent people continued even in a bigger scale (most vividly in Madina and later in Mecca). I therefore cannot consider Yazid to be innocent with regard to the killing of Hussain and his family and companions, and I do not think that any alternative reading of the history could change this conclusion. I feel totally confused when I hear expressions like 'it was a matter that was unfortunately mismanaged!' I only imagine if the prophet (pbuh) was alive, could the same people go to him and inform him that due to a mismanagement, his grandson was brutally murdered and beheaded by Muslims and his granddaughter along with other women and children were taken as prisoners of war? I consider it only a politically correct gesture when people who are reminded of Karbala respond by verse 2:134, where it says 'this was a nation that passed, for them is what they earned and for you is what you earn and you are not asked about what they did'. While I appreciate the message of this verse and its application here, I think verse 12:111 is even more relevant: 'verily there is a lesson in their stories for people of insights'. I find it sad that in a very mechanical way hadiths about the conditions of revolt are used to conclude that Hussain was on the wrong side of the equation. In fact, I am even suspicious about the existence of so many hadiths condemning fighting against injustice and oppression, given that they are all documented in the early era of the Muslim states dictatorship. Further, there seems to be an emerging attitude to defend and justify any ruling system of Muslims in the past and today, come what may. I am puzzled when some people compare Ali ibn Abitalib's treatment of Mu’awiyah, with Yazid’s treatment of Hussain ibn Ali. This to me is a complete confusion of historical facts. Ali ibn Abitalib's problem with Mu’awiyah was not that he did not accept his khilafah. Rather it was because Mu'awiyah kept himself as the governor of Syria despite being ordered to move from the office. Mu'awiyah then prepared a full and a huge army to fight against Ali ibn Abitalib. This resulted in more than three months battle that took the lives of 60,000 Muslims from both sides, including some of the companions of the prophet (pbuh). Mu'awiyah managed to continue his campaign and he became the Khalifa after Ali ibn Abitalib. Hussain ibn Ali on the other hand, as a citizen with no formal political positions, refused to pay allegiance to Yazid, who forcefully became Khalifa by the direct appointment of his father (which practically changed a khilafah system to a kingdom system forever). He with around seventy people, and with his family and women attempted to reach Kufa, primarily to remain safe and unharmed. They were surrounded in the way by the full army of Yazid’s governor, and were then brutally killed and beheaded with his devoted men in less than 24 hours. The comparison of the two events, the people involved and the outcome, to me is devoid of any sense of logic. One may say that politically Hussain made a mistake at the start of this journey. This is a matter of opinion. However, in my view, from religious perspective not only Hussain did not do anything wrong, but he in fact did what many pious leading Muslim figures would do when they find that wrong people and a wrong system are attempting to rule Muslims and represent Islam. Oppressing and unjustly killing a pious person like Hussain, the grandson of the prophet, and his companions and children was a heavy and a deadly price that the ruling system had to pay in order to change a rather democratic system to a dictating one. To my understanding, the resistance and death of Hussain and his companions and some of the members of his family in Karbala also served as a Hujjah (clear reasoning) on why Hussain did not consider Yazid, his system and the outcome of such system, to be legitimate according to the values of Islam. Whenever I read the incident of Karbala, just knowing what Hussain did, makes me value Islam, and in a more abstract perspective, appreciate the importance of standing by the truth. This is why I consider his death to be martyrdom (Shahadah). If you do not follow religion and do not fear hereafter, then (at least) be free (do not be blind followers) in your world. Are there any helpers who would help me? I like to think that if I was alive and in the place at the time, I had the honour of saying ‘yes’ to his call and sacrificing my life to protect him, which was protecting the message of truth. May God bless Hussain, the pious grandson of the prophet (pbuh) and be satisfied with those who sincerely defended him and his cause.